The IZT DAB Archive is a comprehensive solution for quality control and long-term archiving of EDI/ETI streams. It consists of two components: The DAB Recorder records, analyses and archives a DAB ensemble while the Library Server provides a central interface between user and overall system to access monitoring information and recorded content. The DAB Recorder handles recording, analysis and archiving of a DAB multiplex in the DAB Archive and is usually located at the operator’s DAB head-end. It records the EDI or ETI stream that is delivered to the transmitter network into its internal storage and makes the recordings available for remote requests from the Library Server. The DAB Recorder decodes the DAB multiplex in real-time and analyses the multiplex and its components. Index information about the DAB ensemble is transferred to the Library Server. The DAB Archive monitors the input signals for several parameters including the ensemble configuration and subchannel structure. It is possible to check the labels, data types, bitrates and signaling. The audio programs are checked with regard to noise/silence. The Library Server permanently monitors the library structure. Further, it logs and indexes the drop-outs and warnings detected by the DAB Recorder. Users can be alerted about failures via SNMP (optional), E-Mail or SMS. 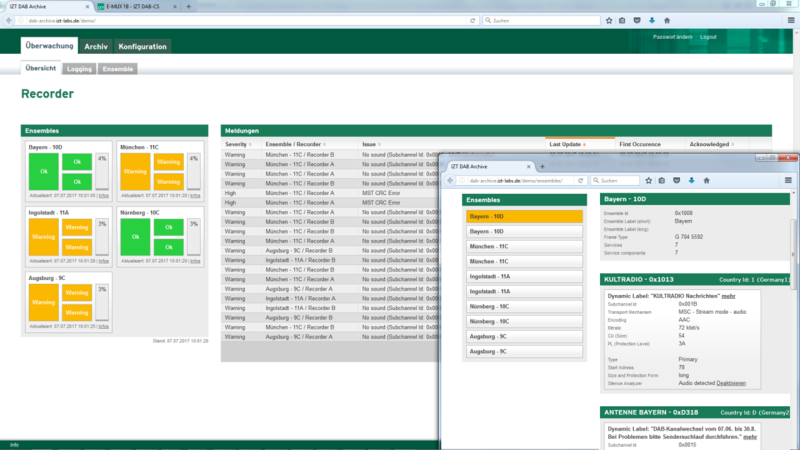 The web interface of the Library Server provides access to all monitoring data and the archived EDI/ETI streams. The user can request downloading the archived content of a specific time and duration. It is possible to export the complete stream, specific subchannels or the audio content of a subchannel. The GUI also provides a filter to search for specific events such as ensemble reconfigurations.